I recently shared with you how I placed a QVC order for a whole load of the Tarte Rainforest Of The Sea make-up products whilst it was on offer on their website. For less than £40 I managed to pick up a foundation, a foundation brush, eyeshadow palette, lipstick, eyeliner, mascara, make-up bag and a lash primer, all for just under £40. I literally could not resist that deal, especially when the foundation alone is worth £28 and the double-ended brush having a value of £26.. The whole collection is currently on sale on the QVC website for £44.88 which is still a massive bargain, especially since it is usually on there for £70 so if you want it then be quick as it does seem incredibly popular. The first product from the collection which I wanted to share with you is the Tarte Rainforest Of The Sea Water Foundation. I hadn't tried a water based foundation before so I thought it was going to have the constiency of water, be really loose and sheer and not give much coverage at all. I could not be more wrong and whilst this may be a bold statement, I would say it was definitely one of my favourite foundations. "This luxurious, lightweight foundation is designed to give full coverage while hydrating your skin, to leave your complexion looking radiant and flawless. Infused with titanium dioxide and zinc oxide and features an innovative pipette dispenser." The Tarte Rainforest Of The Sea Water Foundation comes in 12 shades, ranging from Fair Neutral, the palest shade in the range, to Deep Honey, the darkest. I think this foundation has a great selection of shades for lighter skin but only one shade for darker skin which I think is really disappointing. That said, I do like how on Tarte's website it tells you which shade to get based on your skintone, for example, I chose the shade Fair Neutral because not only was it the lightest shade they offer, but also it is best suited towards people with fair skin but with yellow and pink undertones, which is the perfect description of my skintone. Because of this I found that the foundation matched my skin perfectly which is incredibly rare. I just wish they had a darker shade range to cater for a wider customer audience as I think having just one darker shade is rather disappointing. 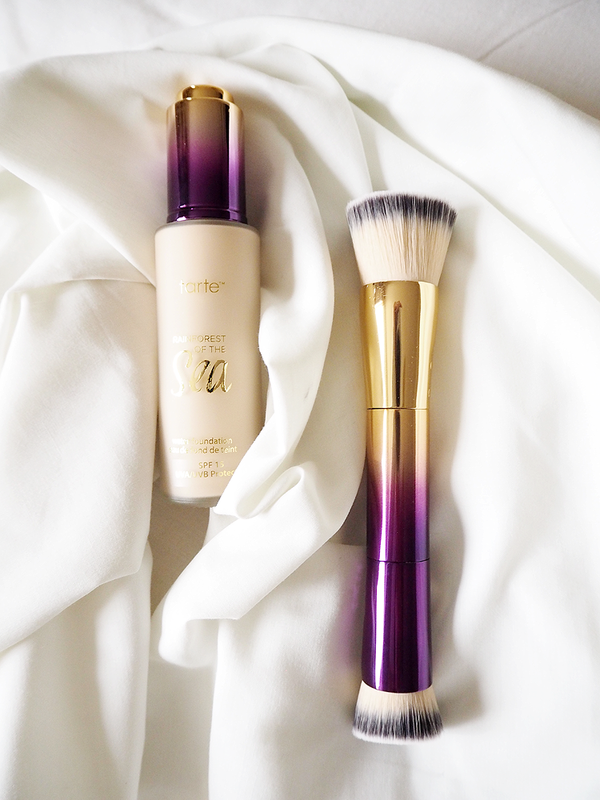 I absolutely love the dark purple to gold ombre which is stretched across the whole range on the packaging so I absolutely adore not only the foundation bottle, but the absolutely beautiful Tarte Rainforest Of The Sea Water Double-Ended Foundation Brush. I mean, just look at it. So beautiful. I will talk about the brush a bit more later but not only do I love the look of the foundation bottle, I love the 'innovative pipette dispenser'. The first time I came to try the foundation I was a bit stumped as to how to get the product out. I thought it was a regular pump as it has a push-down button on the top but in fact it is more like a big dropper. You have to unscrew the lid, revealing the dropper then push out a drop using the button at the top. I love this way of dispensing the foundation as I guess it is a bit of a novelty although it can be a bit messy pulling the dropper out of the bottle so you have to be careful not to waste product when you pull it out. I find that I need 2-3 drops of the foundation to cover my entire face which doesn't seem too much considering they are rather small drops. Like I said before, I was really expecting this foundation to be really runny and loose in consistency considering it is a water-based foundation and whilst it is probably one of the runnier foundations I have tried, it is in no way the consistency of water. It isn't thick and creamy, instead it is lightweight and thin but definitely not in a bad way. This makes the foundation incredibly easy to build up to more of a higher coverage as I prefer a full coverage but I would say just a couple of pumps applied to the entire face gives a medium coverage. When built up, this foundation gives a completely flawless, almost airbrushed appearance on the skin which I really was not expecting. It is not heavy, it is not cakey, it doesn't sink into fine lines on the face nor does it show up any dry areas on the face, something which a lot of foundations seem to do. I found the Tarte Rainforest Of The Sea Water Foundation to be incredibly lightweight and buildable, leaving the skin with a really lovely dewy semi-matte finish. I really wasn't expecting this foundation to be this good! I mentioned before about the Tarte Double-Ended Foundation Brush which I absolutely adore for its appearance but I am ultimately a Beauty Blender kind of girl. I tried applying the foundation with the larger end of the brush but I found that I was itching to get stuck in with my Beauty Blender to save time on blending it out with the brush. As beautiful and pretty as the brush is, I really can't see myself using it that often which is a shame but I am sure that if I hadn't been on the Beauty Blender bandwagon then I would probably really enjoy using it. When I first placed my Tarte Rainforest Of The Sea Collection order with QVC, I was really worried that I had made a mistake with the foundation and hated the thought of wasting my money on buying the wrong shade which I couldn't use but I am completely over the moon with it. I bought the whole collection for less than £40 and now I can see what a great bargain I had, especially when the brush and the foundation alone are worth £54. I can't recommend the foundation from within the range enough and whilst I can't see myself getting a lot of use out of the foundation brush, it sure does look pretty in my make-up brush holder! If you really wanted to try out something from the Tarte Rainforest Of The Sea Collection, or just anything from Tarte in general, it is really worth checking the QVC website regularly as they often have really good deal on. Like now for example, where you can get the Tarte Rainforest Of The Sea Collection for just £44.88. You definitely won't end up regretting it, that's for sure! The foundation sounds lovely! The packaging is just stunning! I really want to try this foundation but I have heard really mixed reviews about it! This sounds amazing, I love Tarte but haven't tried their foundations yet.